Heat oven to 350°F. Lightly grease bottom and sides of 15x10x1-inch pan. In large bowl, stir together Bisquick™ mix, sausage, cheeses, milk and jalapeño chiles, using hands or spoon. Shape mixture into 48 (1-inch) balls. Place in pan. Bake 20 to 25 minutes or until no longer pink in center. Immediately remove from pan. In small bowl, mix mustard and maple syrup. Serve warm with mustard sauce for dipping. Maple breakfast sausage comes in bulk as well as links. If using links, use a paring knife to cut the casings and remove sausage. If you manage to have any dipping sauce leftover, you can store it in a sealed container in the refrigerator for up to 3 days. Sausage ball recipes go gangbusters every year—especially during football season, the holidays and potluck seasons. They’re easy to make, require very few ingredients and are a guaranteed crowd pleaser, so it’s no secret why people turn to them again and again. If you’re anything like us, you like to throw in a twist every now and then to change things up. 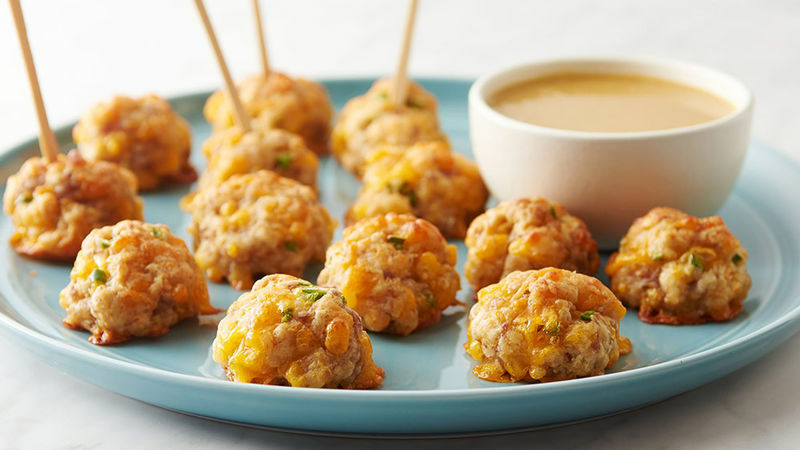 This sausage ball recipe does just that. Maple pork sausage adds a hint of sweetness and diced jalapenos counter the sweetness with a hint of spice. The spicy mustard-maple syrup dipping sauce is the finishing touch that takes this appetizer to a whole ‘nother level. Even if mustard seems polarizing to you, try it with the maple syrup—it’s a game changer! If you’re hosting and are in need of more appetizers for your crowd, let your slow cooker do the work for you with these slow-cooker appetizers.